Our dog blog readers love rescue stories. We found a doozie of a cautionary tale from Moxee, Washington. Here in the northwest we use irrigation canals to water our crops. Many of these water ways have concrete walls. As a result, canals can be very dangerous, so signs are posted to warn people to stay out of the canal. 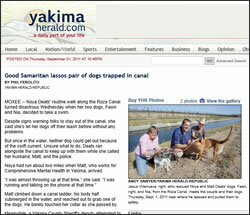 We invite you to follow the link to the report from the Yakima Herald about a couple dogs that found themselves doing a fast dog paddle and needing to be rescued from the Yakima Valley Roza Canal. We applaud the very skilled gentleman from Mexico, Jesus Villanueva.